Smartphone shipments from the Korean manufacturer has totaled 76.7 million units as of Q2 2016 with Apple, Huawei, Oppo, and Xiaomi far behind. Samsung continues to thrive in the increasingly crowded smartphone market. 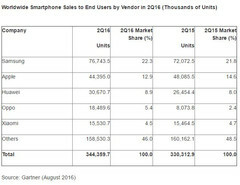 The Korean manufacturer has been the undisputed smartphone market leader for years and the latest statistics from Gartner show its lead to be increasing. Samsung has grown from 21.8 percent in Q2 2015 to 22.3 percent as of Q2 2016 and the recent hype surrounding the Galaxy Note 7 will likely help the company maintain its position for at least the rest of the year. Second place continues to be Apple, though its market share has decreased from 14.6 percent in Q2 2015 to 12.9 percent as of Q2 2016. This corresponds to the company's recent revelation of a drop in iPhone shipments YoY. Third place is Huawei who has grown from 8 percent in Q2 2015 to 8.9 percent as of Q2 2016. Oppo and Xiaomi complete the top 5 list of the world's largest smartphone manufacturers with Q2 2016 market shares of 5.4 percent and 4.5 percent, respectively. Oppo in particular is experiencing tremendous growth as it previously held just 2.4 percent of the market in Q2 2015. Both Chinese manufacturers have driven out Lenovo from the top 5 list and it remains to be seen if next month's Moto Z launch will be enough for the company to claw its way back up.